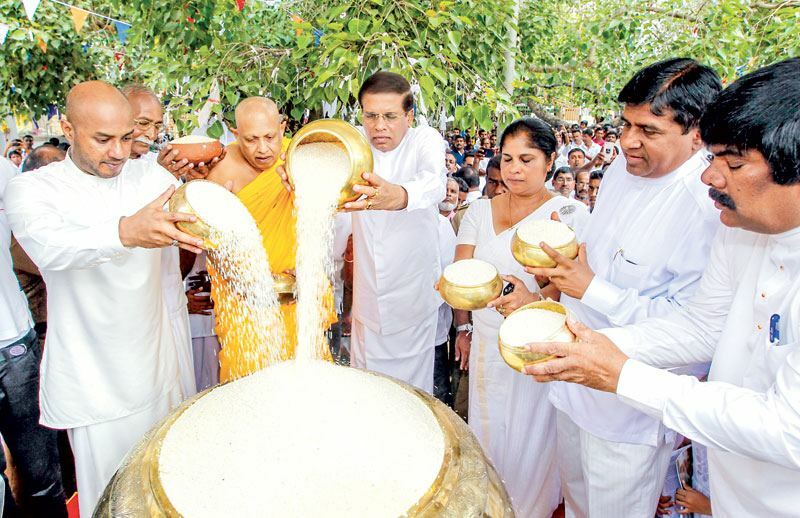 The National Aluth Sahal Mangalya, which is known to be the most venerated agricultural ritual of the Sinhalese, was held under the patronage of President Maithripala Sirisena at the historical Jaya SrI Maha Bodhiya in Anuradhapura. The event had been organized, by the Ministry of Agriculture and the Department of Agrarian Services for the 50th time, under the guidance of the Chief Incumbent of Atamasthana Ven. Pallegama Sirinivasa Thera where the sacred Sri Maha Bodhiya was offered the maiden harvest of the Maha season following traditional exchanges. A large number of farmers from different parts of the country were present at the ceremony. Blessings were invoked on the country at the event, with wishes for rain, a bountiful harvest and a prosperous economy for the country. President Sirisena initially paid homage at the sacred Sri Maha Bodhiya, and obtained its blessings. Thereafter, the venerable Maha Sanga was offered a bowl filled with toxin free indigenous variety of rice. President also distributed endemic varieties of seed paddy that are identical for respective provinces to farmers. The President said that he is committed to fulfil the expectations of the general public who elected a farmer as president. He also noted that the farmers of the country will soon witness the results of the extensive measures taken by the government to realize their dreams. The present government has rendered an incomparable service to uplift the country's agriculture and strengthen the economy of the farmers, he said. He also pointed out that the programme which was implemented by the present government to provide relief for victims of the drought is a novel method and Rs. 7,000 million has already been allocated for the drought hit people. The President recalled that the government has completed the construction work at the Moragahakanda Reservoir and this will end the grievances of the people in Rajarata. He also stated that the reconstruction work of 1,000 more tanks is underway at present to provide sufficient water to the farmers. Minister of Agriculture Duminda Dissanayke presented a souvenir with the picture of the Aluth Sahal Manglaya to the President at the event. Chief Incumbent of Atamasthana and Chief Sanga Nayaka of North and Central Ven. Pallegama Siriniwasa Thera, Chief Incumbent of Ruwanweli Maha Seeya Ven. Pallegama Hemarathana Thera, Minister of Agriculture Duminda Dissanayake, Ministers Wijeyadasa Rajapakshe, Chandrani Bandara, Tissa Karalliyedda, Governor of the North Central Province P. B. Dissanayake, other political representatives, Secretary to the Ministry of Agriculture D. Wijayarathna, Commissioner General of Agrarian Services Development D.V. Bandusena and government officials were also present at the event. President also visited the Jethavanarama Viharaya for religious observances. He also called on the Chief Incumbent of the Viharaya Venerable Ihala Halmillewe Rathnapala Thera. The newly built Sathara Maha Doratu of the stupa of Jethavanarama Viaharaya was also declared open by the President.